Of course, I can't call Night derivative because it apparently wasn't. I wasn't around back then to know, but all accounts indicate that it was a fresh and original piece of work. Just because it broke new ground doesn't mean it stands up over time. Plenty of seminal works look poor in later years. That doesn't seem to be the case with Night. Though it shows its age - particularly in the handling of women and various semi-political issues - the movie still appears pleasant and entertaining. It Happened One Night appears in an aspect ratio of 1.33:1 on this single-sided, double-layered DVD; due to those dimensions, the image has not been enhanced for 16X9 televisions. Despite some moderate concerns, the picture held up well for its age. Source flaws caused very few distractions. Grain could be a little heavy, and I noticed a handful of specks and marks. However, these were quite minor, especially given the age of the movie. Black levels seemed reasonably dark and tight, though they occasionally appeared a little grayish. Shadows also were slightly erratic. While most low-light shots seemed fine, a few appeared somewhat too dark. Night wasn’t a stellar transfer, but it worked quite well overall. Another pleasant surprise came from the monaural audio of It Happened One Night. The film came out during the relative infancy of sound movies and I expected it to sound harsh and scratchy. However, it's actually a very clean and accurate soundtrack. Distortion - which plagued more old mixes than anything else - was virtually nonexistent, even when characters shouted. How did the picture and audio of this 2006 DVD compare to those of the original 1999 DVD? I felt the sound remained the same, but the visuals offered notable improvements. Actually, both looked a lot alike except in terms of source flaws. The 2006 transfer was significantly cleaner than its predecessor. Night offers a few supplemental features, all of which come from the prior DVD. We start with a running, screen-specific audio commentary from Frank Capra, Jr. The director’s son covers the project’s genesis and development, cast, characters and performances, and various production elements. In addition, we encounter a Vintage Advertising section on the DVD that offers a mixture of lobby cards and theatre posters for the film; it provides 12 stills in all. The disc ends with the original theatrical trailer for Night. 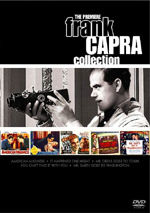 As part of “The Premiere Frank Capra Collection”, we get an extensive booklet. This piece covers It Happened One Night along with four other Capra flicks and different aspects of his career and life in the 1930s. It comes with a mix of photos and other archival materials along with good information. It acts as a quality component. This disc drops a few extras from the original release. It loses trailers for Mr. Smith Goes to Washington and Lost Horizon as well as talent files for Capra, Gable and Colbert and a booklet with brief but informative production notes. As far as a recommendation goes, It Happened One Night gets a positive call, though not an enthusiastic one. I like the film, though it doesn't bowl me over, and the DVD provides pretty decent picture, sound, and supplements. It's not a fantastic DVD, but it seems strong enough to warrant viewing. Note that this release of It Happened One Night currently appears only as part of “The Premiere Frank Capra Collection”. This set also includes You Can’t Take It With You, American Madness, Mr. Deeds Goes to Town, Mr. Smith Goes to Washington, and a documentary called Frank Capra’s American Dream.